According to the news published in Daily Hindustan, Mumbai Vol. 69 No. 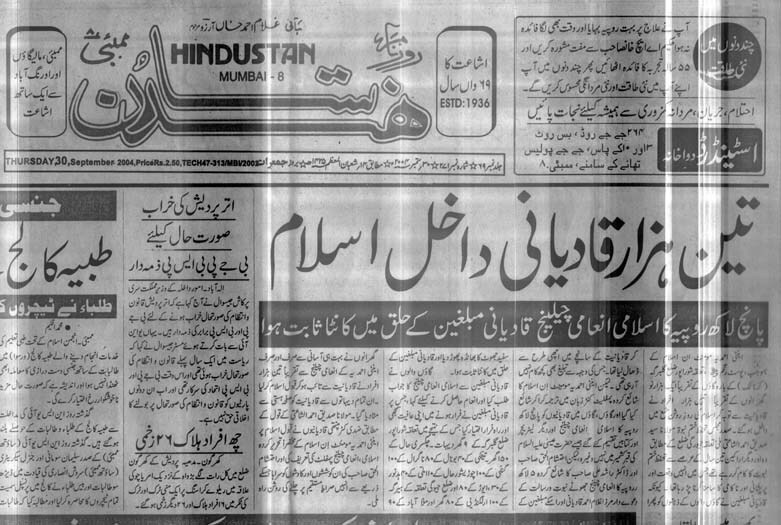 271 dated 30 September 2004, 3000 Ahmadis/Qadianis belonging to 1000 households living in 12 villages of Post Rangam Peth, Taluka Shorapur, District Gulbarga (Karnatak), India, have embraced Islam after denouncing Ahmadiyyat. Qadiani muballighs have been working for years in these villages and had converted entire Muslim population of these villages to Ahmadiyyat. Maulana Syed Siddiq Ahmed of Khatme Nabuwwat along with his associates have been working hard to revert them to Islam without much success. Ahmadi muballighs had brain washed these simple villager who refused to listen to any reasoning. However recently Anti Ahmadiyya literature prepared by Dr. Syed Rashid Ali and Ahteshamul Haq Abdul Bari (former Ahmadi) was translated into local Kunar language and distributed among these villagers. Among them was the Pamphlet offering Rs. 5 lacs reward to any Ahmadi who would prove the quotations from the books of Mirza Ghulam therein to be wrong. Local villagers after reading this pamphlet asked the Ahmadi muballighs to reply to this challenge and claim the reward. Ahmadis preachers tried their best to avoid this issue but the villagers kept pressing them. Finally the Ahmadi Muballighs packed up and ran away from these villages. It was then that they realised that these preachers have been deceiving them and then the entire Ahmadi/Qadiani convert community denounced Ahmadiyyat and embraced Islam at the hands of local Khatme Nabuwwat leader, Maulana Syed Siddiq Ahmed. Praise be to Allah for that. Ahmadis/Qadianis were challenged in this pamphlet to prove that the quotations highlighting the contradictions in the writings of Mirza Ghulam are wrong and earn the reward. This challenge was given in July 2000 but so far no Ahmadi/Qadiani could dare to prove them wrong.